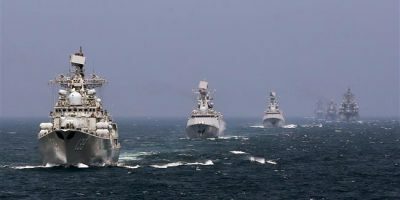 China and Russia have started joint naval drills near North Korea, amid continuing tensions chiefly between Pyongyang and Washington that risk turning into a military conflict. China?s official Xinhua news agency reported on Monday that the exercises would be conducted between Peter the Great Bay, just outside the Russian far eastern port of Vladivostok, not far from the Russian border with North Korea, and the southern part of the Sea of Okhotsk, to the north of Japan. The drills come at a particularly tense time in the region. ?North Korea?s missile and military nuclear programs, long opposed by the US and its allies in the region, have been rapidly advancing in recent months. Japan and South Korea have been looking to the US for protection against what they see as a hostile North Korea. On Friday, Pyongyang fired a missile over Japan for the second time in three weeks. Because of constitutional restrictions, Japan cannot shoot down missiles that fly through its airspace but do not directly target it, and has only been able to heat up rhetoric against North Korea. Tokyo?s chief ally, Washington, has been ratcheting up pressure on Pyongyang with the application of sanctions. Last Monday, stringent sanctions drawn up by the US were?passed?at the United Nations Security Council (UNSC) without opposition. China and Russia are both permanent members of the UNSC, which means they wield a veto power; but while they have had differences with the US on how to deal with North Korea, they opted not to veto the latest sanctions resolution. Beijing and Moscow are opposed to the North Korean weapons programs but believe the issue has to be resolved via dialog. Together, they have proposed a ?double freeze? to end the dispute: North Korea would end its military nuclear program and the US would halt its joint annual exercises with South Korea. But that proposal has not gained traction. While neither China nor Russia has linked the Monday drills to the North Korean dispute, the exercises may act dually as a signal both to Pyongyang and its adversaries. China and Russia held joint drills in the Baltic Sea earlier in July.